This past weekend was a big one for the NFL and Texas high school football. It marked the unveiling of The Star, the new home of the Dallas Cowboys World Headquarters, Ford Center and The Omni Frisco Hotel, a 16-story hotel which will be the tallest building in Frisco at the time of its completion. The Star, which is located just 30 minutes north of Dallas city limits, is a culmination of a partnership between the Dallas Cowboys, the City of Frisco and Frisco Independent School District. Current development practices have taken a marked turn away from putting all the proverbial “eggs in one basket” and are now focused on diversification and “placemaking.” Though the word is a bit overused in today’s master planning lexicon, placemaking describes the positive results that can arise from an authentic Live, Work, Play oriented project. J.F. Finn is a designer with 30 plus years of experience in complex mixed-use projects. 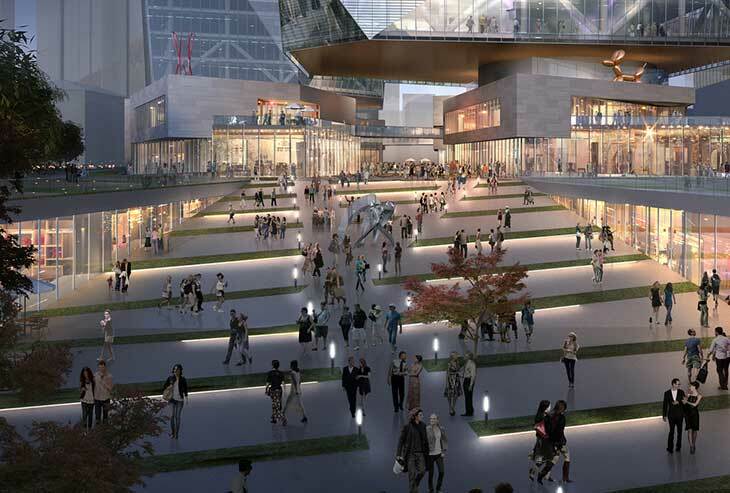 He led the design of MGM Resorts’ $8.4 billion CityCenter Las Vegas development, the largest privately-funded project in the United States, and is now playing an integral role in Gensler’s work at the site of the original Boston Garden. Boston’s answer to Madison Square Garden in the 1920s, “The Garden” was the epicenter of Boston’s basketball and hockey history.